Light sedation can help us take the edge off before minor procedures, like small fillings, periodontal therapy, or even routine checkups and cleanings. Dental fear or anxiety are nothing unusual, after all, as most patients have at least a few nerves before they undergo dental work. Ask Atlanta dentist Dr. George Michaels or a member of our expert team about how nitrous oxide sedation can help you relax in the dental chair. 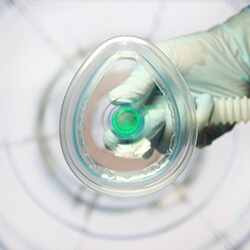 Nitrous oxide is a gas that you breathe in through a small mask during your treatment. Also known as laughing gas, it can make even the most jittery patients remain completely at-ease throughout a range of treatments. After a few minutes of breathing the gas, you’ll start to feel light, tingly and maybe even happy to be relaxing in our comfortable dental chair. After the procedure is over and the mask is removed, the effects wear off almost immediately. That means you can go on about your day without any lasting grogginess. Patients of all ages can safely undergo nitrous oxide, and it can be especially useful for children, who may be sensitive to their first dental treatments. Request an appointment with the team at Midcity Dentistry to benefit from relaxing nitrous oxide today.